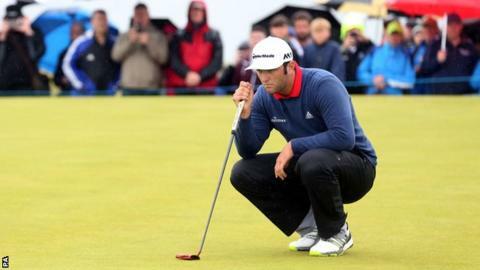 US PGA champion Jimmy Walker has criticised the European Tour for not penalising Spaniard Jon Rahm for a ball-marking error at the Irish Open. Rahm won by six shots but having marked his ball on the sixth green, appeared to replace it in a different spot. Chief referee Andy McFee said the 22-year-old escaped a penalty because of new rules allowing more flexibility. However Walker tweeted the European Tour, saying: "If we don't have rules then we have nothing." Golf's governing bodies announced a two-part change to the rules following American Lexi Thompson's four-shot penalty for replacing her ball in a marginally different place during the ANA Inspiration in April. A joint statement from the R&A and USGA said players "should not be held to the degree of precision that can sometimes be provided by video technology". It added: "So long as the player does what can reasonably be expected under the circumstances to make an accurate determination, the player's reasonable judgement will be accepted, even if later shown to be wrong by the use of video evidence." Rahm moved his ball out of playing partner Daniel Im's line using the conventional width-of-the-putter method, placing his marker to the side of the clubhead. But when he put his ball back in play to hole out, he replaced the ball in front of the marker, thus marginally closer to the hole. "I knowingly put my marker on the side of my ball. I know it's a little suspicious sometimes but I knowingly did it," he said. "I moved my marker so it was not in the way of Daniel's and put it back, and when I replaced my ball I thought it was in the same exact spot." In a follow-up tweet, Walker stated he did not think Rahm was trying to gain advantage, but that his sloppiness warranted a penalty. The Ryder Cup player added: "Intent had nothing to do with it. I'm sure there wasn't. But it was wrong." McFee discussed the incident with Rahm when he was on the 13th hole and later explained: "One of the points in the new decision is that the outcome depends a lot on what the player says and his explanation of the events. "He said 'I knew I marked it to the side and then I was trying to make an effort to put it back to the side'. He's definitely made the effort. "We're talking about the difference between the ball being lifted at 10 o'clock on the ball mark and put back at 11 o'clock, which is not a problem."